The Jackson Hole Wildlife Film Festival is delighted to announce the finalists selected for its second biennial 2014 Jackson Hole Science Media Awards. This year’s saw more than 480 entries competing for 21 special awards. More than 140 international judges screened an aggregated 3000+ hours in order to select the finalist films. Finalists in the peer-judged Craft Categories (Visualization, Editing, Writing and Audioscape) and Special Consideration nominations will be announced August 15 (NB. added below). 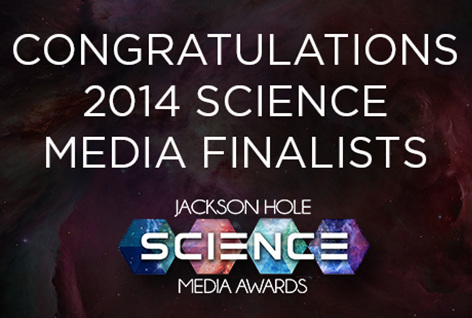 The 2014 Science Media Award-winners will be selected by a distinguished panel of judges preceding the three-day Science Media Symposium, an industry conference hosted in partnership with WGBH in Boston, September 17-19, and will be announced at a gala Awards Celebration at the New England Aquarium, on September 17th. The Ultimate Formula: What is the Universe Made of? Wild Kratts: When Fish Fly! About JHWFF: Recognized as the premier event of its genre, the Jackson Hole Wildlife Film Festival is an unparalleled industry gathering. Hosted biennially in Grand Teton National Park, over 650 international delegates participate in an exceptional slate of leading-edge equipment presentations, seminars and state-of the-art screenings. The Festival’s international board of directors is comprised o f some of the most well respected companies affiliated with conservation and natural history and science filmmaking and broadcasting. Current Board Members include: Animal Planet, BBC Natural History Unit, Discovery Channel, Disneynature, Fujinon, The Goro ngosa Project, Howard Hughes Medical Institute/Tangled Bank Studios, National Geographic Television and National Geographic Channel International/NatGeo WILD, Nature/WNET, National Parks Conservation Association, The Nature Conservancy, ORF/Austrian Broadc asting, Off the Fence Productions, PBS, Sony Electronics, Terra Mater Factual Studios, Vulcan Productions, WGBH/Boston and World Wildlife.